The 2017-2018 Faculty Fellowship for Teaching & Learning application process is now open. Deadline to apply to become the next Faculty Fellow is March 24, 2017. Visit this CFEI webpage to learn more about the Faculty Fellowship program, learn about our university’s previous Faculty Fellows, and download the application form. This could be you! The CFEI Haiku By Felicity Grandjean What’s higher ed about? 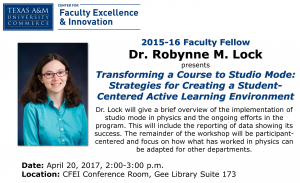 Seek ideas at CFEI. Possibilities! Visit. Call. Email. Supporting our Faculty. It is our mission. Teach, Learn, Write, & Serve. Quality education. Commerce Faculty! Faculty Center For resources & events. For lifelong learning.